You probably didn’t even notice how NetGranule entered your PC. This adware application is responsible for displaying multiple commercial ads when you browse the Internet. Most of the time, these ads appear on your web browser when you access online shopping malls. NetGranule ads may appear useful at first, but you should never click them. In fact, you will do yourself a favor if you remove NetGranule from your system immediately. This adware application may accidentally lead to various computer security issues, and it is for the best to avoid them altogether. The good thing about NetGranule is that we know almost all there is to know about it. The application belongs to the SuperWeb group of adware applications. The family includes such annoying intruders as Key Lime Lizard, Boxed Books, Rad Rater, and many other applications. All of the programs from this family are practically identical. Thus, whatever we experienced with the previously released programs, we can expect the same from NetGranule as well. One of the main problems we have with NetGranule is that users do not understand how it enters their computers. It is true that the application has an official homepage, but you cannot download it from netgranule.net. The website uses the same layout as all the other homepages from the SuperWeb group. These sites are created to give the impression that you are about to install a useful application. Nevertheless, none of the SuperWeb adware apps live up to their promises. Now, then, if you cannot download NetGranule directly, where does it come from? Our security research shows that this application travels in software packages. This means that you have downloaded it bundled with other freeware. If you have recently downloaded an application from a third-party file sharing site, it is very likely that NetGranule has come with it. This also means that you installed this application willingly. 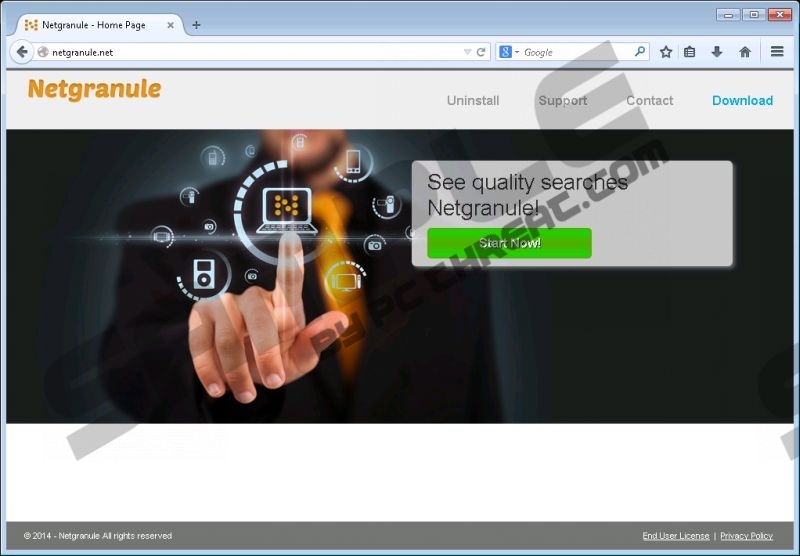 Once installed, NetGranule adds extensions to Mozilla Firefox and Internet Explorer. It may also work on the older Google Chrome versions, but if your Google Chrome is up-to-date, the extension will be blocked. NetGranule will collect data on your web browsing habits, and then make use of it to generate commercial pop-ups. You need to avoid those NetGranule ads at all costs because the application does not check whether the ads are embedded with safe content. Hence, in the case of malevolent exploitation, NetGranule might even become a malware distribution tool. You have to make sure your computer remains safe and clean, and the best way to do that is to remove NetGranule right now. Once you uninstall this application, scan your PC with a powerful antispyware tool to see whether your system is absolutely secure. Open Uninstall a program and remove NetGranule. Click Uninstall a program and remove NetGranule. Access Add or remove programs and uninstall NetGranule. Quick & tested solution for NetGranule removal.